Laurence was born on March 1st, 1938 in Ireland. 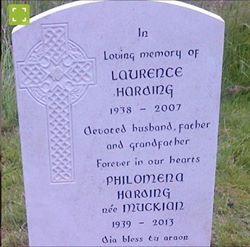 Laurence's father was John Harding and his mother was Rose Ann Leahy. His paternal grandparents were Nicholas (Nicklos) Harding and Margaret (Maggie) Heffernan. He had three brothers and a sister, named Nicholas, Stephen, William and Margaret. He was the third oldest of the five children. He died at the age of 69 on June 18th, 2007.